When you look up the definition of wildlife the description will include the phrase “wild animals living in their natural, undomesticated state”. Yet, when we think about the current state of wildlife, how often do we see wildlife in an unnatural environment in circuses, zoos and aquariums? When I volunteer to present Animal Hero Kids humane education school presentations, I show two photos, one of a tiger in a cage and one of a tiger in the wild. A show of hands tells me which tiger the students would choose to be. I bet you can guess what their answer is. When wildlife is taken from their home and family, often the parents are killed protecting their baby. This is true for elephants, orcas, dolphins, chimpanzees and more. The good news is that there are Animal Hero Kids and teens speaking up for captive wildlife. When youth discover the true story behind captive wildlife shows and theme parks they act. I met my first elephant being used in a circus over three decades ago; this elephant was being led in the hot sun giving kids a ride on her back. I saw the grey powder that was covering her old injuries begin to come off near a wound on her upper chest area. As I watched, the man who worked for the circus touched the wound with a small, inoffensive-looking black stick with a box on the end. This was a transistorized electroshock prod. I called the police and reported this – surely this was animal cruelty? >> That’s when I found out it’s legal to use electroshock prods on elephants, except in municipalities where electroshock prods are banned. I first heard about this amazing Animal Hero Teen from my friend and undercover videographer and filmmaker Tim Gorski. Tim captured Juliette’s lifesaving adventure in his documentary film, “How I Became an Elephant”. Juliette was 14 years old when, after saving and fundraising for her quest, she realized her dream of rescuing an elephant. In Thailand, there was a female elephant who was chained all the time, and used by the elephant tourist industry to breed other elephants. The elephants’ legs and feet were injured from the constant chaining and abuse. She led a miserable life, like so many elephants used in the entertainment business all over the world. Juliette’s dad accompanied Juliette on her journey to Thailand. When they arrived in Thailand, they were saddened by the condition of elephants being used by their handlers, called “Mahouts” by locals, to beg in the city streets at night outside of busy bars and in traffic. So many elephants in the tourist elephant riding business were thin and had injuries where their chains and ropes were. Juliette knew that many elephants escaped their captivity and broke away from their chains when they sensed an impending tsunami. 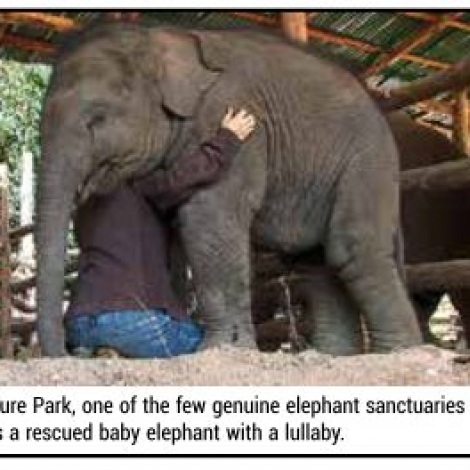 Tim introduced Juliette to Lek, the woman who ran an elephant sanctuary called Elephant Park in Thailand. Juliette marveled at the gentle nature of the largest land mammal – even after they were harmed by humans, they still had a peaceful stillness about them. The founder of the sanctuary knew about the elephant that Juliette had fundraised for, in order to buy her away from her life of slavery. Lek and Juliette set out to see the elephant. Tim filmed as Lek began to negotiate, diplomatically, for the elephant’s release. A deal was finally made and transportation arranged with a large truck to travel to the sanctuary. It was dark when the entourage arrived at the elephants’ haven. The elephant walked down the ramp, using her trunk to sniff the new surroundings. Her feet were causing her considerable pain. Lek tended to her sores, and the elephant was now safe from harm forever. 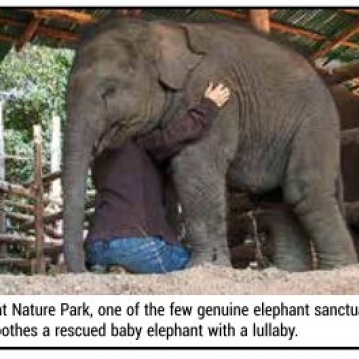 Juliette’s dream saved this one elephant and began her on a path to continue to save more. In 2012 I presented Juliette with the Ricky Williams Animal Hero Teen Award (named after the Heisman trophy winner and former National Football League star) at the Fort Lauderdale International Film Festival. A group of 175 students watched Juliette receive her award on the big screen via a Skype call from California. Today Juliette continues her dream of helping all elephants by booking speaking engagements in schools and events, and mentoring others in becoming leaders. Keep Kids HAPPY On-the-Go Dear Earth Talk:Brave teen rescues dog from brink of deathExpanding Your BoundariesPhotographers can be animal heroes tooWant to Create a Bookworm?